Waldom Electronics supports all Molex New Product Introductions (NPI) through Waldom's NPI Launch program. Our NPI Launch program allows Molex authorized distributors to purchase new products in less than factory MOQ for immediate shipment, helping Molex and its authorized partners speed delivery of product to end users with minimal risk of excess inventory in the channel. Quarter reel packaging available on select Molex products, download the Molex Micro Products Mini-Reel Program Guide for complete details. Molex's unparalleled selection of innovative Bulb Socket solutions matches the needs of vehicle makers around the world for safety, performance, variety and robust features. Molex's expanded line of DuraClik™ connectors with terminal retainer options provides superior electrical contact reliability, mating retention and space savings compared to competitive versions for high-vibration and high temperature applications. Available in 2-15 circuits with both tin and gold plating options. 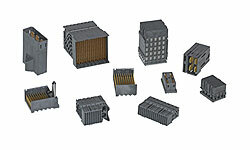 DuraClik™ components include: Standard, ISL, TPA, and Headers. Silver-plated contacts support up to 50.0A current with superb electrical reliability and significant cost savings over Gold-plated systems. The Silver-plated terminals eliminate fretting corrosion issues common with Tin-plated systems. The high-performance, compact MXP120™ Sealed Connection System is designed to perform in harsh environments and can replace common 1.50mm systems in space-constrained safety-restraint, body electronics and powertrain applications. Leveraging full keying and color-pairing features, foolproof CP-6.5 wire-to-board connectors enhance user-safety while speeding up consumer and industrial interconnect assembly applications. Available in: 2, 4 and 6 circuits. Low profile, high-durability spring clips offer smartphone makers maximum cost savings with superb interconnect performance over a wide working range. The sleek TermiMate™ system minimizes shadowing in LED lighting applications while providing space savings and reduced component costs. Available in quarter reel packaging. 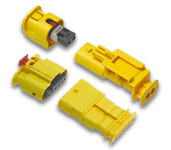 Molex's line of FFC/FPC connectors are available with push and flip-style actuators, which are pre-assembled covers that secure the connection between the FFC/FPC and the connector terminals. Molex is continually developing lower-profile and higher-density versions to meet the downsizing needs of electronic component markers. Waldom offers these innovative tape and reel parts (Part Number-TR) in cost effective quarter reels as well as the standard Molex reels. Halving the tooling and operational costs of plug-and-receptacle power systems, Ditto wire-to-wire interconnects and pre-assembled harnesses increase cost-savings and operational efficiency of low-amperage consumer and lighting applications. Ideal for tight-packaging applications, the ultra-compact 504740 FPC connectors help simplify cable assembly. Waldom offers these innovative tape and reel parts (Part Number-TR) in cost effective quarter reels as well as the standard Molex reels. High-Durability Class USB 3.0 connectors and cable assemblies provide robust connectivity to support high-speed computing, consumer and automotive applications. Ideal for tight-packaging applications, the ultra-compact 504754 FPC connectors help simplify cable assembly. Waldom offers these innovative tape and reel parts (Part Number-TR) in cost effective quarter reels as well as the standard Molex reels. Achieve up to 6A of power and electrical reliability in an ultra-compact design with SlimStack Hybrid Power connectors, designed for battery and other power applications for mobile devices such as cellphones, Tablet PCs and portable medical equipment (Plug and Receptacle). Waldom offers these innovative tape and reel parts (Part Number-TR) in cost effective quarter reels as well as the standard Molex reels. Ideal for tight-packaging applications, fine-pitch SlimStack™ SSB6 board-to-board connectors offer maximum space savings, mating guidance, and secure electrical and mechanical contact for all types of mobile devices (SSB6 Receptacle and SSB6 Plug). Waldom offers these innovative tape and reel parts (Part Number-TR) in cost effective quarter reels as well as the standard Molex reels. Slimstack Armor™ 0.35mm pitch connectors deliver up to 3.0A of extra power through protective metal covers, and provide superior mating guidance and electrical contact assurance for mobile device and other tight-packaging applications. High Current Wire-to-Wire and Wire-to-Board Connector Family with a TPA feature that prevents terminal back out in high vibration applications. The Super Sabre™ Power Connector System is ideal for robust, higher-current applications, which require design flexibility for wire-to-wire and wire-to-board configurations in both vertical and right-angle orientations. Sabre provides current ratings up to 18.0A per circuit at 600V and is available in a wide range of wire gauges and insulation thicknesses.